Thursday July 23rd 1896 I was 45 years old today. It began raining soon after we got up and it kept it up all day. I did some sewing and got the meals. 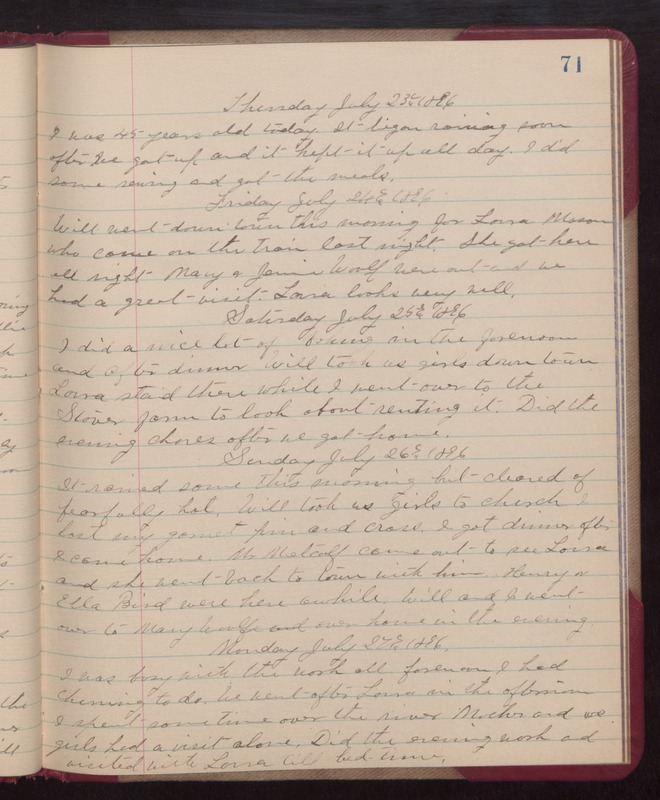 Friday July 24th 1896 Will went down town this morning for Laura Mason who came on the train last night. She got here all right. Mary & Jennie Woolf were out and we had a great visit. Laura looks very well. Saturday July 25th 1896 I did a nice lot of baking in the forenoon and after dinner Will took us girls down town. Laura staid there while I went over to the Stover farm to look about renting it. Did the evening chores after we got home. Sunday July 26th 1896 It rained some this morning but cleared of fearfully hot. Will took us girls to church. I lost my garnet pin and cross. I got dinner after I came home. Mr Metcalf came out to see Laura and she went back to town with him. Henry & Ella Bird were here awhile. Will and I went over to Mary Woolfs and over home in the evening. Monday July 27th 1896 I was busy with the work all forenoon. I had churning to do. We went after Laura in the afternoon. I spent some time over the river. Mother and we girls had a visit alone. Did the evening work and visited with Laura till bed-time.